This is a blog about sea nomads, maritime lifestyles and human evolutionary science; in short Bajau Laut, marine biology and The Aquatic Ape Theory. My name is Erik Abrahamsson – a Swedish anthropologist and photographer. I am interested in indigenous cultures, maritime lifestyles and evolutionary science. Since 2010 I have studied about the sea nomads Bajau Laut and I have been living with them for an extended period of time in Philippines, Malaysia and Indonesia. I speak one of their dialects, Central Sinama, which is widely spread in Philippines and Malaysia, and the basics of Indonesian Bajo. My fieldworks have resulted in academic papers, several articles, radio programs and photo exhibitions about Bajau Laut – “The People of the Sea”. I am Polish translator of Elaine Morgan’s books on AAT. Great to have found this – will follow! I’m a journalist and filmmaker who lived in Bali for 10 years. I’m currently doing research for a high profile documentary on the Bajau Laut. I’ve already done some editorial stuff on the Bajau Laut of Torosiaje and Wakatobi. The film seeks to illustrate their way of life when they were still living predominantly on boats and before the advent of destructive fishing practises. We’re exploring various narrative ideas right now, but one is to identify and elderly Bajau as a narrator who can tell us what life used to be like – the film would then recreate their marine based lifestyle – one that reflected harmony with ecosystems as well as hunting etc. I was wondering if Togian could be a potential location for finding Bajau still spending extended periods on their boats – pongka and lama. 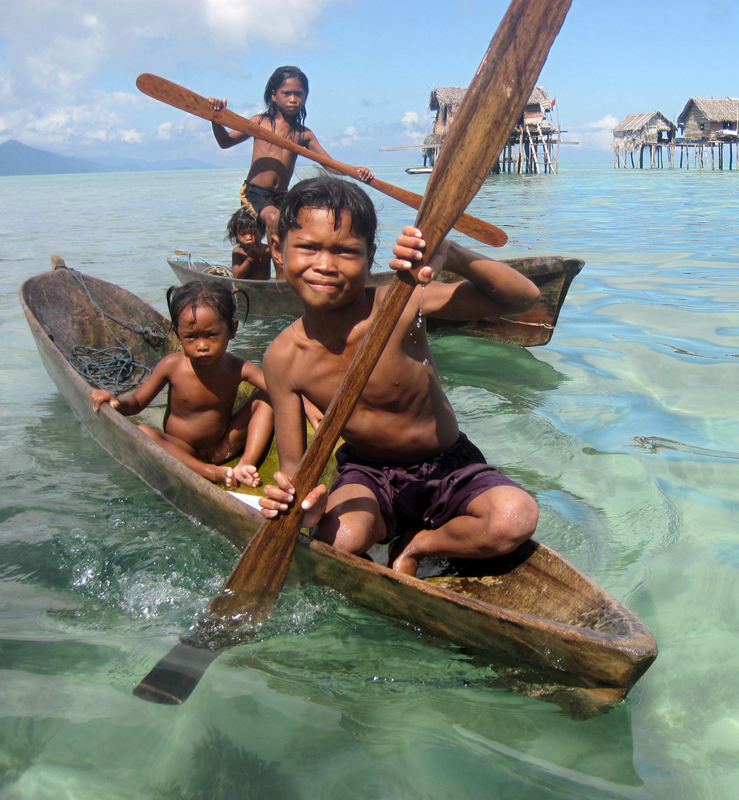 We were told by boat -dwelling Bajau around Torosiaje that there were similar communities in Togian islands. Any chance that we could have a chat on Skype or via email. My details below! Thank you. Beautiful photos and I am also interested in following your blog/travels. Replying to the message from December 23, 2013 at 11:18 pm. Gosh Erik. I have just noticed your reply after almost 2 years! Someone did email me to ask regarding Bajau houses recently. If he hadn’t, I wouldn’t even noticed that you are inviting me to Semporna back in January 2014. My apology. I’m always in Sabah for every two months and I have been to Semporna for three times this year alone. By the way, if im not mistaken, I saw you walk passed me by during the Lepa Festival Semporna 2015 this year (judging from your picture in this blog). Hi Ophelia, You might be interested in the work of Arkitrek (http://arkitrek.com/) a Kota Kinabalu-based green design company. I just stumbled upon this blog and read your comment regarding your interest in studying the typology of the Bajau houses in Sabah. As of now, there are two researchers that I know currently doing the architectural typology of Bajau Laut, one is a PhD candidate from Universiti Malaysia Sabah (UMS) and another one being myself. Yes, some of the traditional houses are still intact though they are highly dependable on locations. I woudn’t recommend Gaya Island for the location of your study due to the urban exposure of the surrounding city. If possible, try to find a site located on the east coast of Sabah if you want it to be as authentic as possible. Regarding your research interest, I would highly advice you to contact me in order to situate your research and fulfilling the research gap. To Abrahamsson and Brunt – I have read your fantastic dissertations. I even made several references to your research. Hats off. Hi Eafifi! Thanks for your comment. I have forwarded your message to Ophelia and hopefully she will come back to you. I agree that it is better to study Bajau houses on the eastern coast of Sabah instead of in the KK area. Are you in Sabah now? I am actually going there in the beginning of January for a short visit (Semporna). Maybe we can meet there. I have just come across your blog and read with great interest about your travels around Malaysia, Indonesia and the Philippines. For the last 8 years I was based in Sabah, Malaysia and was the Coordinator of the Semporna Islands Project (www.sempornaislandsproject.com). I have long had a deep and personal interest in the Sama Dilaut, especially the lives and livelihoods of particular families from the Semporna area (I recognise several faces and places in your photographs!). In 2003 I wrote my undergraduate thesis on their language (‘Divided by Land but United by the Sea’: A comparative study of the Sama-Bajau language group). I am currently studying for my MA in Anthropology of Development in the UK, and continue to be fascinated and engaged with the Sama Dilaut, looking particularly at their participation in or marginalistion from Marine Protected Area management. Hi Helen! Thanks for your commentary. Actually I have heard your name mentioned many times when I have visited Sama communities in the Semporna region. You seem to have made a lasting impression on both children and adults … I wonder if you have an electronic copy of the essay you wrote in 2003. It would be interesting for me to read! Good luck with your MA studies! Hej! Jag är en 17 årig svensk lantbrukselev från jämtland med intresse för samhällsfrågor såsom hållbar miljö,ekonomi och medmänsklighet. Har fridykigt en massa när jag var yngre men senaste 2 åren har det varit så kallt i vattnet att jag inte tagit mig i.
Är iaf intresserad i dykning, samhällsfrågor och hållbara livsstilar och skulle gärna vilja ha en dialog med dig om hur du tog dig dit du är idag, och prata om klimat,politik,ekonomi för dessa folkslag vore väldans intressant. Hej Olof! tack för ditt meddelande. Jag har precis kommit tillbaka till Sverige från rean i Sydostaien. Ja, det finns mycket intressant när det gäller Bajau Laut – såsom dykning, klimat, livsstil och ursprungsfolks rättigheter. Jag kom i kontakt med Bajau Öaut år 2010 då jag studerade på Österlens folkhögskola. Jag hade möjligheten att bo hos dem i en liten by i Filippinerna, där jag följde med och fiskade, lärde mig språket m.m. Vi kan höras vidare på mail! Please feel free to email me with anything you feel is relevant. Good job with the blog! Thank you for sharing information for future references and studies! Dear Miguel, min vän! Thanks for your comment and questions. Yes, there are plenty of Sama-Bajaw dialects, especially in the Sulu-sea. Most of the time I have been living with Central Simana speakers in Davao City. In the city there are approximately 3 000 Sama Dilaut and they are still speaking Central Sinama, and the children learn their mother tongue rather then Bisaya (most of the children do not attend school). Other groups of Sama-Bajaw speakers in Davao City, however, speak ther mother tongue less frequently. In Semporna, Malaysia, there are a big Sama-Bajaw speaking community (they speak Sama Semporna, Central Sinama, Sama Ubian, etc.). Also here most children are learning their mother tongue and many people on the islands speak no language except Sama-Bajaw. However, children who are attending school and are more adapted to the Malay community, are likely to speak Malay at home rahter than Sama-Bajaw. I have also been to southern Sulawesi where the Sama people are speaking a different Sama-Bajaw dialect, called Bajo Indonesia. Also here most people are still speaking their mother tongue and many words are similar to Central Sinama. There are many Sama-Bajaw dialects and I don’t know if any of these are endangered. I have been living with those who still are or recently have been boat-dwellers, and they are almost exclusively still speaking their mother tongue. So, I think the Sama-Bajaw languages will live on. Thank you Erik for sharing this wonderful knowledge of the Bajau peoples. I was wondering if you ever came across any information how far up north the Bajaws wandered? Did they reach China? Did they reach Formosa in the old days? Hi Rob! Thanks for your comment. I don’t think that Bajau reached China or Taiwan. However, they reached Manila in the 90’s because of unrest in the Sulu Sea. We met in london in may, I was the “babyswimming” one. Hi Dirk! It was nice to meet you in London and to know more about your pioneer work with water babies! You have a very informative web page. I have tried to find your Youtube clips of baby swimming but haven’t found them. Can you please send the link? Zena Holloway i mentioned earlier. Hi, thanks a lot for sharing. It’s a lovely footage. Hi Erik, I am a Filmmaker writing a film script on a Badjao character. I would like to know more details about their culture, social setup, traditions ,religion, and history. Please site me some sources on the Internet or books I can read to give me a fuller background on the Badjao . Can you also give me contacts, people I can write or call to arrange a visit to a badjao community or badjao representative. Thank you for all your help. I would like to know more about your project, when are you planning to start? Will you make a documentary? You can also contact me on my e-mail: erik@theaquaticape.org. Good luck! This an absolutely wonderful page you have. I was just introduced to it through an encounter on instagram. Visiting the Bajau Laut has been a dream of mine for a couple years now and I am happy to say that I am finally visiting South East Asia this November and December to make it happen! My original plan was to go to Semporna and figuring out a way to visit a village but I was informed that since the insurgence from the military people are not allowed to camp in Tun Sakaran Marine Park and that in Semporna I am only allowed to visit Mabul Island. That is one option, but since I will also be visiting Indonesia I was wondering if you could recommend me a place I would be able to visit. Hi, Kiyoko! Thanks for your inspiring comment! Yes, it’s true that travel in Sempoprna has become more restricted, because of the insurgent groups. But I would be surprised if you are only allowed to travel to Mabul Island. I actually think that you can visit more islands (if you don’t stay overnight). In Indonesia, I can recommend the Tukangbesi Islands southeast of Sulawesi. Here you will find many Sama people in the village of Sanpela at the island of Kaledupa. I am actually planning to travel to Semporna in the middle of December this year, so if you go for Semporna we might meet there! Would you recommend me just get there to Semporna and talk to locals as to where I am allowed to visit? I wouldn’t mind just visiting for the day. My only issue is budget since I will basically be couch surfing and going as economically as possible. I’ll be visiting Tawau/Semporna for about a week, Indonesia for about two weeks, and Philippines for three so I will already be in Philippines when you get to Semporna but I would have loved to meet you and talk to you in person! Thank you for the recommendation! I might consider visiting the island of Kaledupa. Hi again! I don’t think there will be any problems in Semporna … However, I am in touch with local people there and I am waiting for an update from them. In Semporna, Kaledupa and Davao (Philippines), I can help you come in contact with local people that you can stay with. If you want more information, please contact me by e-mail: erik@theaquaticape.org. Amazing work Erik, and very inspiring ! Thanks for deep concern with our treasure culture of Badjaos, God bless bro..
By the way I’m an artist, architect actually…and also concern to promote and learn more about our tribe culture..so if you allow me to paint one of your artistic picture of our badjao brothers, this will be great as i’m planning to have it entered on prestigious NCCA exhibit in Philippines hopefully next year…and for sure this organization or even your name to be mention on the exhibit if granted…..
Hi Larry! Thanks for your comment and appreciating words. Yes, you can paint one of my photos. You can choose which photo you want to use from my blog and flickr page and then I will send you the photo in high resolution. Good luck! I wlould love to see the end result! Hi Aitor! Thanks for your comment! Yes, this research that wrinkled fingers make it easier to handle wet objects is definitely in favor of the AAH. Regards, Erik.